I've been searching around for examples of good outdoor ads to show they follow the principles I wrote about recently. Nike's World Cup ad for England follow these principles: Single visual. Visual is a person. Singular simple message. Comprehension is immediate. Strong contrast between image and background. The creative itself is the headline so no additional copy needed - very smart. It is also well branded and has loads of space (yes, white), allowing it to breath. This image is visually arresting. It has the additional recall-benefit of having a celebrity in the ad. Celebs in ads can sometimes be a bad thing. We remember the ad but sometimes forget the product or message. But not here. Rooney is the product. He represents the England team. 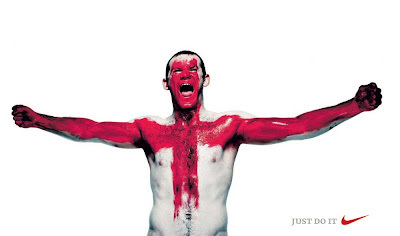 And of course he visually becomes both the England flag and the passion of English football fans. This is pure genius. I'm very jealous. And with the tendency for many English fans to take their shirt of at the football then there is a chance some will copy the body paint for future England matches. Nike could even encourage this by providing body paint to supporters and a tent at the ground to paint themselves up.